This April, Regina will host an exhibition of paintings marking a major milestone for Saskatchewan plein air artists Cam Forrester, Greg Hargarten, Paul Trottier, Roger Trottier, and Ken Van Rees. The group, also known as the Men Who Paint, has been exploring Canada’s wilderness areas, canvases on backs and brushes in hand for a decade. 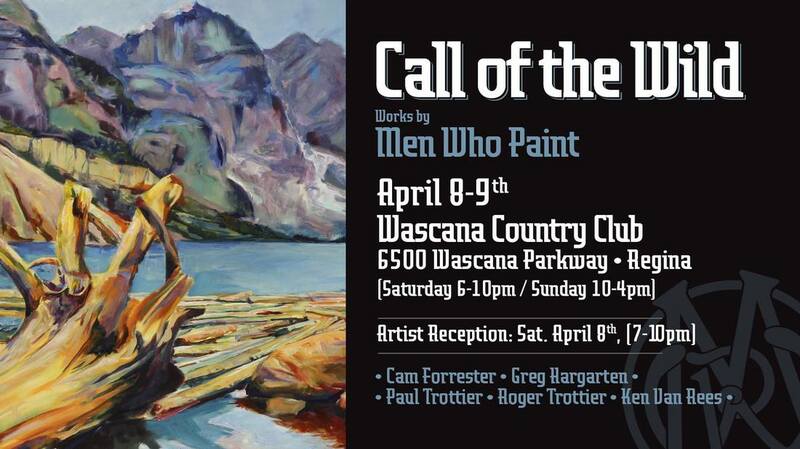 Their work will be featured in an exhibition of paintings at the Wascana Country Club in Regina on April 8th and 9th 2017 The Artists’ reception will take place Saturday from 7pm - 10pm. Since their formation in 2007, Men Who Paint have embraced plein air painting. Their travels have seen them at locations across Canada, including Yukon’s Ivvavik National Park, Ontario’s Algonquin Park, Alberta’s Banff National Park, Nunavut’s Ellesmere Island, and British Columbia’s Sunshine Coast, as well as Saskatchewan locations Prince Albert National Park, Emma Lake, La Ronge and Cypress Hills. The Men Who Paint discovered their common artistic interest at the now-defunct U of S Kenderdine Campus at Emma Lake which was an important centre for fine art in Saskatchewan for almost 80 years. The 55-acre boreal forest art campus served as the group’s “initial spiritual home” and a base for many painting excursions to northern Saskatchewan destinations in the early years. “All of us kind of found our way there, for various reasons” Hargarten recalled. He, for example, was treated to his first stay as a 40th-birthday gift from his wife. He then returned annually. Paul Trottier was director at the Kenderdine campus at the time and had the original idea for a group. It eventually grew to include five painters, with diverse backgrounds: a college professor, a golf course executive, a graphic designer, an art store owner and a retired curriculum developer, all united by a passion for painting landscapes. The artistic experience of the group is varied, some are professionally schooled in the arts, while others build on their natural interest and affinity for expressing the environment. Their combined artistic experience offers diversity, and their collective dynamic thrives on each individual’s passion for painting. “The group dynamic creates a certain energy level and excitement. It’s been a real journey for us—we learn a lot from each other, and incorporate that into our individual styles,” Hargarten explained. Men Who Paint’s ten year odyssey has seen them paint in many remote Canadian locales. Their first major excursion took them above of the Arctic Circle to a camp in the northern most part of the Yukon. There they spent 10 days in tents, visiting various locations on foot, or in some instances by helicopter, The result was over 100 pieces of artwork, a half hour television special entitled Halfway to Heaven and inclusion in the Parks Canada Permanent Collection. Since then the group has visited Ellesmere Island, Banff National Park, and Algonquin Park which held special meaning when they painted in areas Tom Thompson explored. “Algonquin Park and Thomson’s visits there are really the beginning of a new era in Canadian painting,” explains Hargarten. The Men Who Paint are booked to revisit the famous Ontario park this fall to commemorate the 100th anniversary of Tom Thompson’s death there and give a lecture and presentation of their work. They have also experimented with making their own pigments from the landscape. Soil collected from areas in Saskatchewan and other parts of Canada was ground up with pestle and mortar then mixed with egg tempura or acrylic gel. The idea began with Men Who Paint artist Ken Van Rees, a soil scientist at the U of S, who discovered the work of Symeon Van Donkelaar. Van Rees was intrigued with the idea and realized that painting with soil could further connect art to a sense of place. Others in the group were also excited and the resulting 2015 exhibition Breaking Ground at the University of Saskatchewan’s Snellgrove Gallery presented collection of paintings with a unique relationship to the landscape they represent—landscape painted with the landscape. Their reputation is now starting to grow further afield and they have recently been invited to visit Schwaan, Germany to join German plein air painters in the field and exhibit at the Kunst Museum in 2018.